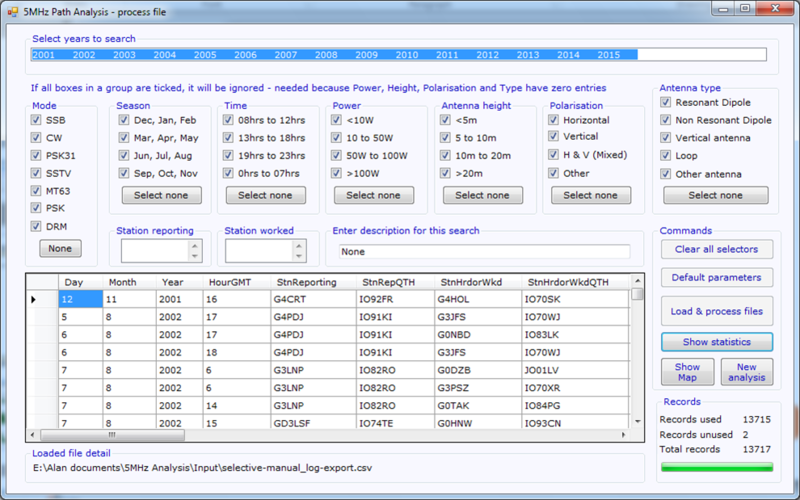 This page is for downloading a program to analyse the 5MHz QSO and manual beacon logs. It has a dedicated data download button on the RSGB database site (registration required) and then allows you to select analysis of the data on any of the criteria included in the logs, such as by date, time, mode, power, callsign and so on. It also downloads ionospheric data from SPIDR in the USA to allow calculation of signal launch angles, and correlation with the E & F inonospheric layer parameters. 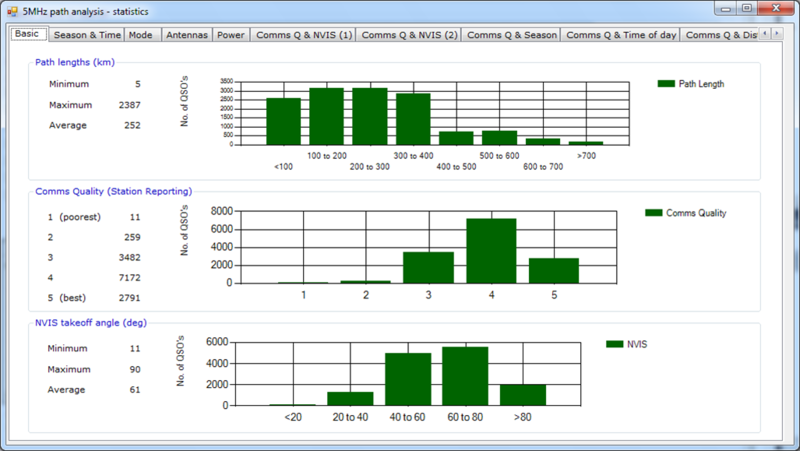 Results are shown in a spreadsheet style interface and as a set of charts for simple visual interpretation. They are also recorded to a simple .csv file that can be opened by just about any spreadsheet, and the charts used are saved as a set of .png files. 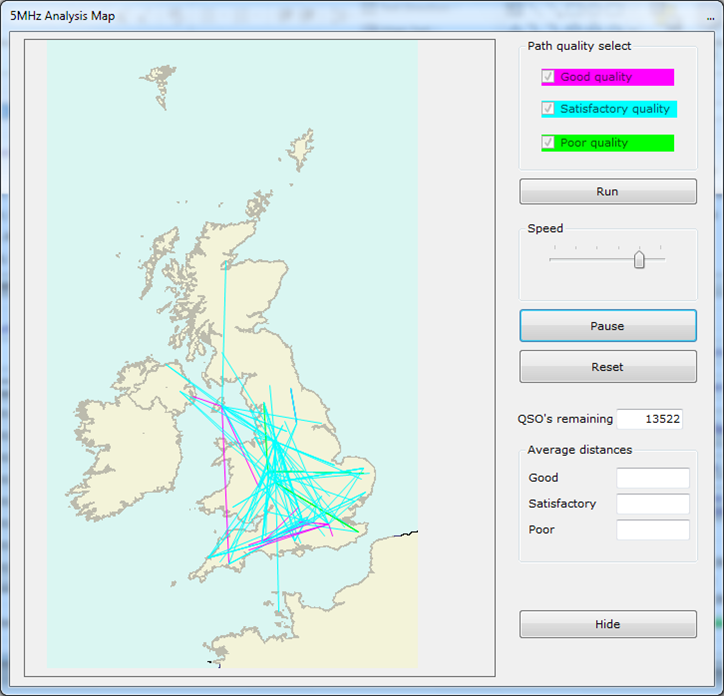 The program also shows the QSO paths on a map of the UK, in different colours for the various signal qualities. It’s written in Visual Studio Express 2010 32 bit. It requires Microsoft Net Framework 4 which is available for download. The program installer, written using Inno, will let you know if your machine requires it to be installed first. It will run on Windows XP SP2 or 3, Vista and 7. For reasonable analysis speed you will need at least 1GB of RAM and current CPU. It runs, albeit rather slowly, on an old 1GHz laptop with 768MB of RAM. It will not run on W95, 98 or ME.